Robert Mugabe is a politician, who was the President of Zimbabwe, the longest reigning and oldest African president. He assumed power as the President of Zimbabwe on 22 December 1987. Prior to that, he had served as Prime Minister, head of government from 1980 to 1987, when he became the country’s first executive head of state. Robert Gabriel Mugabe was born on 21 February 1924, near the Kutama Jesuit Mission in the Zvimba District northwest of Salisbury, in Southern Rhodesia. Robert’s father, Gabriel Matibili, was a carpenter and of Malawian ancestry while his mother, Bona, was a daughter of Chief Gutu of the Karanga tribe. Mugabe was the third child of six children. However, he became the eldest left, after he lost his two elder brothers, Michael and Raphael when he was still young. In 1934, Robert Mugabe was left to take care of his younger ones after his father abandoned the family in search of greener pastures. Mugabe received academic education in Marist Brothers, Jesuit schools, and Kutama College. As a youth, he was an introvert, who spent most of his time with the priests in his Catholic diocese and with his mother. He was also known as an academician and took his books seriously. After his basic education, Robert Mugabe obtained a Bachelor of Arts degree from the University of Fort Hare in 1951. He later earned six more degrees through distance learning including. He has a Bachelor of Administration and Bachelor of Education from the University of South Africa. He also obtained a Bachelor of Science, Bachelor of Laws, Master of Science, and two Master of Laws, all from the University of London External Programme. He is seen as one of the leaders of the rebel groups against white minority rule and was a political prisoner in Rhodesia for about 11 years. After he was released from prison, he left Rhodesia to launch a fight during the Rhodesian Bush War from bases in Mozambique and subsequently became a hero by the end of the war in 1979. Mugabe was voted in during the general elections of 1980 as Prime Minister on Zimbabwe’s independence day. Between 1982 and 1985, over 20,000 people died in ethnic cleansing, courtesy of an attacked launched by Mugabe on his former allies ZAPU. The president who ruled Zimbabwe for over 29-years, once said he will not step down the throne until he turns a hundred years old. While still married to his wife, Sally Hayfron, whom he wedded in 1961, Mugabe began an extra-marital affair with his secretary, Grace Marufu, who was 41-years younger than him and was married to one Stanley Goreraza at the time. However, he married Grace and made her first lady of Zimbabwe, following the death of Sally Hayfron. Mugabe was alleged of having a racist attitude towards white people. According to John Sentamu, the Uganda-born Archbishop of York in the United Kingdom, Mugabe is the worst kind of racist dictator for having targeted the whites for their apparent riches. 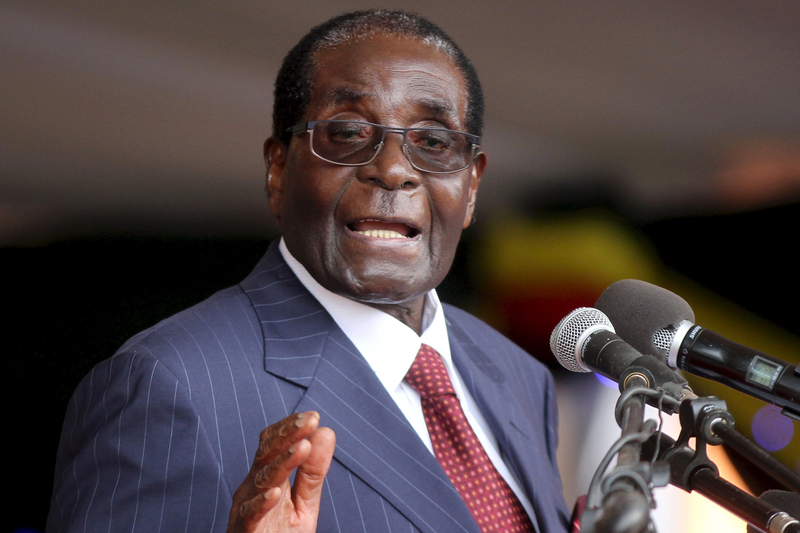 Mugabe has been uncompromising in his opposition to LGBT rights in Zimbabwe. In September 1995, Zimbabwe’s parliament introduced legislation banning homosexual acts. In 2015, following the U.S legalization of the act, Mugabe placed a punishment of Beheading any gay caught in the act. He also referred to lesbians and gays as being worse than dogs and pigs. Mugabe has been married twice in his lifetime. He first got married to Sally Hayfron who was a teacher originally from the Gold Coast(modern-day Ghana). They met during a teacher’s training course in the Gold Coast and after dating for a while Sally decided to follow Mugabe to Zimbabwe. The pair later got married in April 1961 in Salisbury, Southern Rhodesia. They had just one son who was born in 1963, unfortunately, he died of severe malaria in 1966. Also, Sally later came down with kidney failure and died in 1992. After Sally’s death, Mugabe took another wife “Grace Marufu.” They both tied the knot in 1996 and have three children together including; Bona Mugabe, Chatunga Bellarmine Mugabe, and Robert Peter, Jr. Mugabe later stated in an interview that his marriage to grace wasn’t based on love but borne out of the pressure he was getting from his aged mother who wanted to have grandchildren since he lost his first child and only child. After his marriage to grace, he said that they both grew to learn each other in terms of their likes and dislikes and things became easier from then on. As a president, Mugabe had the power to acquire any home or car of his choice both for personal or official use. He has a Ballito Mansion which has been described as a home fit for royalty. The property boasts of unique Indonesian Balinese architecture, lush vegetation, extensive parking areas and two man-made lakes. In terms of his cars, Robert Mugabe’s Mercedes Benz S600L was custom-built in Germany and armored to a “B7 Dragunov standard” so that it can withstand landmines, AK-47 bullets, and grenades. It is fitted with CD player, movies, Internet and anti-bugging devices. He also has a Rolls Royce. Though some citizens of Zimbabwe would have liked this to be true, however, the former president though quite old is still very much alive. 1. He became a lecturer at Chalimbana Teacher Training College in Northern Rhodesia between the years 1955 to 1958 after his graduation. It was around this time he was highly influenced by Marxist works and by the-then Prime Minister of Ghana, Kwame Nkrumah. 2. On March 4, 1980, ZANU won 57 out of 80 Common Roll Seats and Mugabe was elected to lead the first government as prime minister. After his election, he attempted to build Zimbabwe on the foundation of an edgy union with his ZAPU rivals. 3. He happens to be the first prime minister of independent Zimbabwe and the then President to win a first prize jackpot of Z$100,000, in 2000. The lottery was accessible to all those clients who had more than Z$ 5,000 in the ZimBank accounts. 4. The erudite ex-president received three honorary degrees; two Law degrees and a Master of Science degree while he was in prison. Robert Mugabe celebrated his 94th birthday on February 21, 2016, in a grand ceremony organized by his subjects. In May 2016, President Robert Mugabe of Zimbabwe granted amnesty to all female prisoners regardless of offenses, except those on death row or serving life sentences. In June 2016, during the official opening of the 24th Children’s Parliament in Zimbabwe, the veteran ruler told the youngsters that he was once like them, but now his days were numbered.